Madhuri Shekar’s situation comedy (emphasis on the situation) offers an unexpected, if somewhat stilted, twist on meeting the parents. 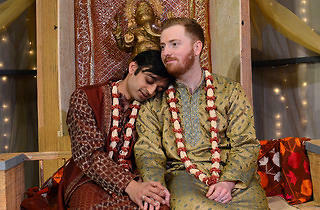 The Los Angeles–based, Chennai-raised playwright opens on a meeting between two gay men at a Bay Area Hindu temple. 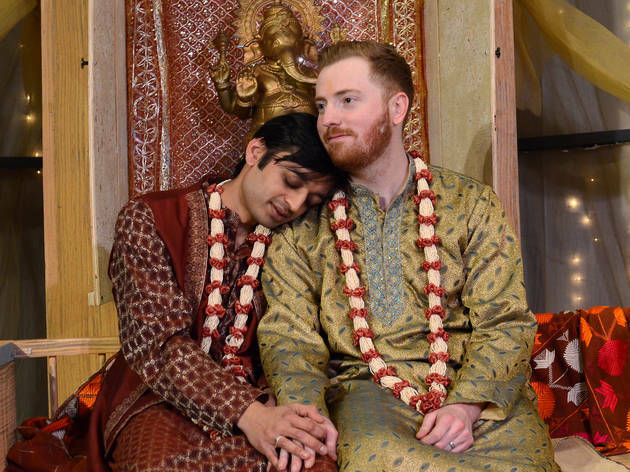 Naveen (Kaiser Ahmed) is instantly intrigued by Keshav (Riley McIlveen), who’s clearly Caucasian but who seems to practice more traditionally Indian customs than Naveen himself, who’s the Americanized son of immigrant parents. In the next scene, the pair’s first date, we learn Keshav was an orphan bumped from one foster home to the next until being adopted by Indian parents, now long dead; in their honor, he changed his name and converted to Hinduism. We next cut to six months later, when Naveen is ready to introduce Keshav to his traditional-but-trying parents (Kamal Hans and Alka Nayyar)—when we first meet them, they’re watching Gus Van Sant’s Milk to soak up some gay history. But while Mom and Dad know Keshav is a man, they aren’t prepared for him to be white. And the unannounced arrival of Naveen’s sister Arundathi (Suzan Faycurry), in a tizzy over her own, traditional marriage, further gums up the works. Director Anna C. Bahow’s cast crafts believable familial relationships, for the most part, though the production’s staging lagged significantly at the press preview I saw. But Shekar does the actors and the audience no favors by asserting facets of those relationships that we can’t see: We don’t get to witness Naveen and Keshav’s courtship, or really anything that attracted them to one another in the first place. Naveen and Arundathi both assert that their parents’ marriage is passionless, but there’s no evidence in front of us to suggest as much. And Arundathi’s mild troubles with her husband are impossible to corroborate when we never hear from him. Rasaka Theatre Company’s production is just the second of A Nice Indian Boy, which Shekar wrote as the thesis play for her M.F.A. at USC and was first staged last year by L.A.’s East West Players. The playwright has said she’s working on a screenplay adaptation, and frankly, it feels like a screenplay is what the play really wants to be, with its quick scene cuts and decidedly un-heightened storytelling (currently slowed by protracted, furniture-moving scene changes). The opened-up cast size, locations and potential for more backstory that film could provide might be just the niceties this almost-alluring story needs. Rasaka Theatre Company at Victory Gardens Biograph Theater. By Madhuri Shekar. Directed by Anna C. Bahow. With Kaiser Ahmed, Riley McIlveen, Kamal Hans, Alka Nayyar, Suzan Faycurry. Running time: 2hrs 10mins; one intermission.